The appeal to collectors of 20th century Continental porcelain falls largely into two camps: those who are keen to acquire good quality table and tea ware and those who are looking for decorative items whether they be vases, lamps, boxes, figures or plaques. Limoges, although established in the 18th century as a manufactory, seems during the later 19th century and early 20th century to have produced or decorated far more porcelain than seems feasibly possible. One can only assume that many pieces marked Limoges were spuriously named. However, there is plenty of good quality porcelain produced at Limoges that does, none-the-less, rise above the mediocre. 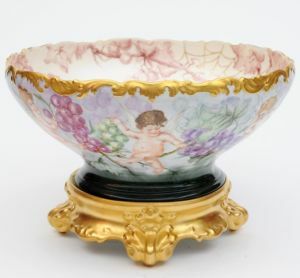 A Limoges (Raynaud et Cie) porcelain bowl and stand, dated 1908. Although not nearly to the same extent might the same statement be made about Dresden, a city synonymous with Meissen. It also spawned a plethora of makers using the mark Dresden, although in the twentieth century only the Saxon Porcelain manufactory can really lay claim to being resident in the city. 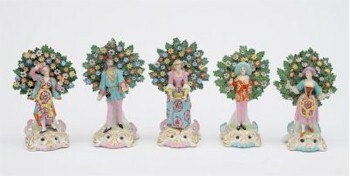 A Dresden porcelain cabaret set. Elsewhere Germany, despite two catastrophic wars, was a powerhouse of quality porcelain production throughout the century with many eighteenth century concerns still going strong. 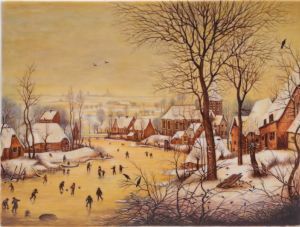 Amongst them Berlin, Hoechst, Ludwigsburg, Frankenthal and Sitzendorf - all of them producing good figures and tableware and Berlin particularly for its painted plaques. 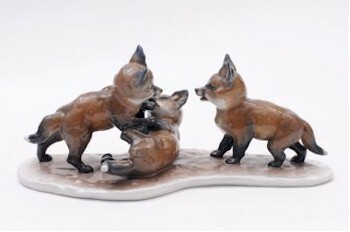 A Rosenthal porcelain group by Fritz Heidenreich, circa 1944. Elsewhere in Europe, the Danish concerns of Royal Copenhagen and Bing & Grondahl are primarily known for their figures of animals and children, but the former was also responsible for the ever popular Flora Danica tableware. The Royal Dux concern of Eduard Eichler produced often large scale figures, most popularly with under shot enamel colours. It was a factory with a confusing geographical history being swallowed up by Czechoslovakia, then Germany and the Soviet Union and is now in the Czech Republic. There is no mistaking the tell-tale factory mark of the raised pink triangle. A set of Samson (Paris) 'gold anchor' figures. Also whilst considering confusion, there is always the Paris concern of Samson to consider. Formed in the 19th century making bone fide museum replicas and replacements for collectors, there is more than a suspicion that a degree of under the counter sales occurred with the production of facsimile copies of Meissen, Derby, Chelsea and others. The Samson workshops operated well into the mid century and the irony is that Samson copies are now being faked in return.